Endometriosis author, speaker, and psychologist Ania G. launches a crowdfunding campaign to have her book, ‘Alone in the Crowd: Living Well with Endometriosis’ published into five languages: German, Russian, French, Polish, and Lithuanian. Endometriosis author, speaker, and psychologist Ania G. launches a crowdfunding campaign to have her book, ‘Alone in the Crowd: Living Well with Endometriosis’ published into five languages. In 2014, it does not make sense for a woman to have to wait 10 years for a diagnosis… Too many women suffer in pain and silence and have no idea what is wrong with them. Endometriosis is a disease that impacts every aspect of a woman’s life, from her health to her psychological well-being to her relationships. Unfortunately, statistics show that getting properly diagnosed with endometriosis is often a ten-year journey for its sufferers. 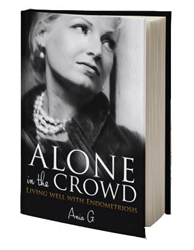 In her hope to raise awareness about living with endometriosis, endometriosis author, speaker, and psychologist Ania G. has written the upcoming endometriosis book ‘Alone in the Crowd: Living Well with Endometriosis’. Recognizing that endometriosis is a disease that impacts 175 million women around the world, Ania G. will be translating her book into five languages: German, Russian, French, Polish, and Lithuanian. In order to do so, she is asking for help from the online community of people who believe that this message is one that is important to share through a Pubslush crowdfunding campaign. Surviving Chernobyl at age eight, Ania G. learned at age 24 she had Endometriosis. She is now on a mission to reach out to the 175 Million women globally who suffer from Endometriosis. Author, speaker, and psychologist Ania G. shares her story with her new book, Alone in the Crowd - Living Well with Endometriosis, which is being published by BEYOND PUBLISHING, in Las Vegas, Nevada and is currently being translated into German, Russian, French, Polish, and Lithuanian.